Taking some initiative from Mr. Paulson, I've come up with an alternative bailout plan that's quite simple. Instead of spending the projected 700B USD to save our financial institutions, we can purchase 301,139,947 (estimated US population) Tenori-Ons. A Tenori-On for every man woman and child in America. Political popularity will soar. (One must also realize that this plan hinges completely on Yamaha's ability to conjure up 9.5427529 Tenori-Ons per second, if we want our them in our hands this year, and believe me we do). Not only will this cost significantly less ($361,367,936,400 < $700,000,000,000), I'm also told it is the solution to every problem ever. Q:Your children complaining because you haven't fed them in 4 days? A:Tenori-Wait. Go feed those kids. And finally, Q:Financial Crisis? 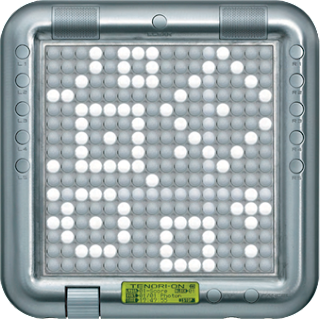 A:Tenori-On! Videos of this thing are all over youtube. Musicians such as Battles, Four Tet, and Jim O'Rourke have already embraced this beast. Will you be next? God I want one, too bad they're a thousand bucks. There has got to be a cheaper version. I don't care about the visual stuff, I just want to ease of beat creation. I've had a serious internal struggle with justifying a massive splurge and not leaving my apartment for 6 months after purchasing one. Also, I read somewhere it costs so much only because of the prior research, not that the components/matericals are too expensive.